One, two or four pocket machines designed to suit all types of dough. Weight range from 10g - 470g with production rates up to 6000 pieces per hour with variable speed options. 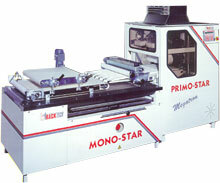 When used in conjunction with pinner moulder, can produce baps and long rolls up to 230mm long. Weight Range 10g to 470g. Bulk dough feed (full one bag mix) reduces labour requirement. Dry process eliminates the costs of divider oil. Easy Cleaning reduces down time.